Jarman CEO Business Advisor on NHK for International Businesspeople in Japan – Jarman International K.K. NHK’s Easy Business for Work. We hope this effort will make it easier for Internationals to be more successful doing business in Japan. 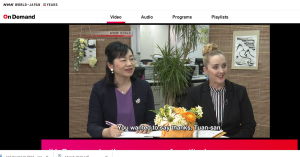 Tips and hints for better communication abound and for Japanese people watching the show, it offers excellent insight into the feelings of your non-Japanese clients and business partners. Jarman International continues work to bring Japan and the world closer.